River rafting is an enjoyable outdoor activity, but it does require having an assortment of equipment so that you can have a great time while remaining safe. Here are some of the things to add to your bucket list of river rafting supplies. If you plan to go river rafting frequently, then you will want your own raft rather than renting one. You can find a raft that suits your requirements with the correct number of seats, and you must also take care of it by making the appropriate repairs. Make sure to have an air pump to fill the raft with air along with several oars to help you row the raft on a river. Despite knowing how to swim, you must have a life jacket. Each passenger on a raft requires a life jacket that fits properly, and these items are typically made from a bright yellow material that is easy for others to see in the water. Make sure that a life jacket is in good condition with straps that you can fasten tightly to withstand the fast moving water in a river. On a warm day, you can wear a swimsuit while rafting, but you will want a swimsuit that is extremely durable. Choose a swimsuit that covers your body and that fits correctly so that the garment will remain in place while you are in the water. Select a swimsuit that dries quickly so that you won’t have to cope with soggy fabric all day. When the weather is cooler, you should wear clothing that provides more coverage. Rather than wearing cotton garments, you should look for garments that are made of synthetic fabrics that won’t absorb a lot of water from a river and that will also dry faster. You can layer your clothing when it is cool, but you can also remove garments when the temperature warms up throughout the day. You should protect your feet while river rafting, so this means that you need shoes. However, regular footwear won’t work because the items are damaged by water. Fortunately, there are sporting good stores that sell river rafting shoes that are made from materials that dry quickly and that will have slip-resistant soles. These shoes are available in a variety of styles to suit your particular needs. 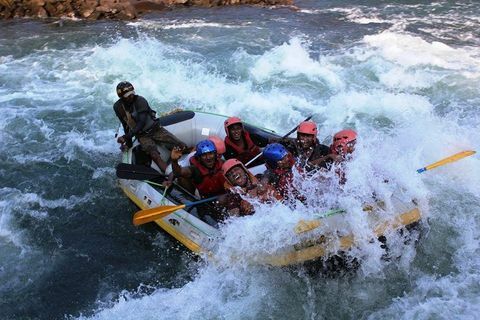 It is essential to protect your head while rafting because the boat may capsize, so you might hit your head on rocks or other objects in the water, leading to an injury. Try on numerous helmets that are made for this sport, and also, verify that the straps fit comfortably underneath your chin. If you wear prescription eyeglasses or contact lenses, then keeping water out of your eyes is vital, and some helmets have visors that can cover all or part of your face. If you plan to go river rafting early in the morning or during the evening, then you will need the additional light from a headlamp. You can find battery-operated headlamps that are resistant to moisture, and you can strap one of these devices around your protective helmet.